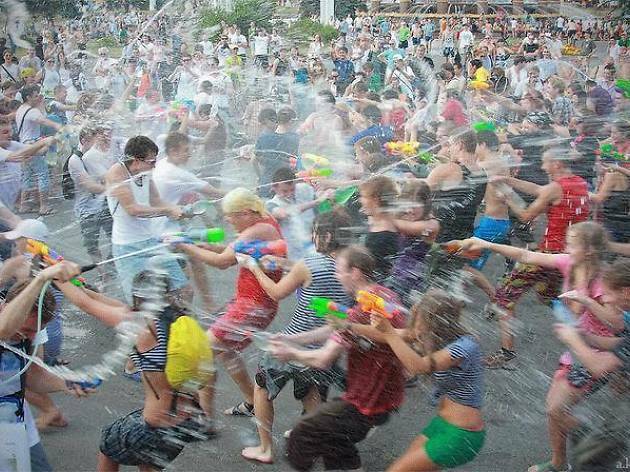 Head to Millennium Square tonight for a massive water fight! Worldwide icon-chevron-right Europe icon-chevron-right United Kingdom icon-chevron-right England icon-chevron-right Bristol icon-chevron-right Head to Millennium Square tonight for a massive water fight! Get down to the fountains in front of At Bristol in Millennium Square tonight from 7pm and join in a giant water fight, organised by the brilliantly named Smile Instigation Collective. From 7pm, you're invited to join fellow Bristolians with water bombs, pistols, buckets and whatever else you can think of to get stuck in to giving one another a damn good soaking. Entry is free, although donations to help support future events and cover costs with At Bristol are welcome - there are well over 3,000 people attending the Facebook event page, and with the sun out and the people of Bristol always up for these sort of shenanigans, turnout is expected to be high.